Samuel K. Burlum provides insight into what it takes to own and operate a small independent business on Main Street, and provides small business owners the tools to survive the hazards that plague small businesses from becoming successful in his attempt to advocate the importance of buying local. According to the Small Business Administration, small businesses are a major part of the economic engine of the United States economy, yet small businesses across America continue to struggle, even though Wall Street has seen recent record gains. One business leader attempts to assist small businesses to catch up with the times, with the release of his new book. Samuel K. Burlum, a career entrepreneur, Investigative Reporter, and Author, shares in his latest book, Sam Burlum’s “Main Street Survival Guide for Small Businesses,” perspectives on concerns that effect small businesses on the ground. Burlum lends his experience to readers of this new work, as he takes an individual step by step of what it takes to build from the bottom up a successful small business enterprise. The Author, Samuel K. Burlum is no stranger to small business ownership. He is also one of the founders, Board Member, and CEO/President of Extreme Energy Solutions Inc., a green tech company that offers environmental technology that aims to combat harmful toxic engine-vehicle emissions and offers green consumer products in over five hundred retailer locations nationwide. Prior to his tenure at Extreme Energy Solutions, Inc. Burlum owned and operated his own small business enterprise before becoming recruited to make an impact in the green tech industry. Burlum has also lent his services as a business consultant to other start-up companies which offered emerging technologies and localized small businesses in helping them become more sustainable. “The reason I set out to author Main Street Survival Guide for Small Businesses, is that most of the small businesses and local independent merchants that would seek out my expertise could not afford to hire a business consultant. As much as they desperately needed my assistance, most small business owners did not have the budget or financial means to have a qualified expert on staff,” expressed Burlum. “I wanted to pro-offer a tool, a point of reference where small business owners could look to in seeking valuable business strategies, marketing and advertising ideas, and guidance on how to improve their operations, while saving money behind the register for business growth. I was determined to develop a collection of methods and practices that I felt had proven their worthiness, that were actually put to use, by either one of my business partners, mentors, or even within businesses I had owned and/or operated; giving readership examples tested by real world circumstances,” continued Burlum. Sam Burlum’s “Main Street Survival Guide for Small Businesses,” is 304 pages, twenty-two chapters of methods put to practice; business theories that have been put to work in the field in growing a small business enterprise from an idea in a two car garage on Main Street to becoming a major player in the green tech industry; among other examples and working models of businesses that have benefited from the practices that are reviewed in each chapter. 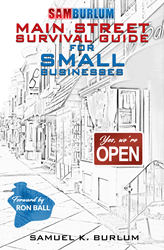 The book also includes a list of external business references and trade organizations for small business owners to seek additional guidance and potential business to business connections; regardless if a business is brand new or if it has been in existence for a number of years. The hard cover version of “Main Street Survival Guide for Small Businsses,” is now available via Amazon.com and list for just $34.95; while the soft cover edition is offered at $24.95. Seekers of this well thought out collection of business knowledge can also get the e-book download for $9.99. Forwards for the book were written by Ron Ball, Beverly White, and Patricia Singer. Other contributors to this book project include: Cover Art- Brand Worx Productions; Layout-Lloyd Arbour; Editor-Caryl Eissing and Consultant-Dan Hollis of The Magic of Selling LLC. This book was completed on February 2, 2018 and for release on February 8, 2018. This is Samuel K. Burlum’s second book to be released. His first book, “The Race to Protect Our Most Important Natural Resource, Water,” was released June 22, 2017. In addition to his first two books, Burlum is credited in having over one hundred published articles in print and/or online; which focus on the subject matters of small business advocacy, innovation, technology, environmental concerns, public policy issues, transportation, health and wellness, and tax code reform. Mr. Burlum holds an Associate’s Degree in Applied Sciences, having majored in Business Management while attending Berkeley College, Woodland Park, New Jersey. Burlum is already underway with his third manuscript, “Life in the Green Lane-in Pursuit of the American Dream,” available via In Demand on Indiegogo.